Bonhams' eye-popping Aston Martin sale on May 21st at the Aston Martin Works Service in Newport Pagnell, UK includes two amazing classic Astons identical to ones used in the James Bond films created for a die-hard 007 fan -- reports Driven. 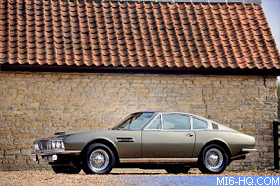 Painstakingly recreated by the Aston Martin Works Service from original models, the star of the show in our opinion is this 1968 Aston Martin DBS Vantage Sports Saloon perfectly replicating the one driven by George Lazenby in 1969′s On Her Majestyâs Secret Service with olive green paint and a black leather interior. Expected to fetch up to about $115,000, this is in fact our favorite James Bond Aston Martin, the 1964 DB5 from Goldfinger being a tad overexposed â not that it isnât an incredible car of course; in fact, the Bonhams sale also includes a steering wheel from the DB5, estimated at up to $5,800 alone. 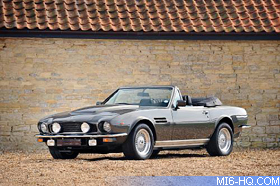 The other 007 car in the sale is an exact replica of the 1986 V8 Volante used in 1987′s The Living Daylights, also known as the âPrince of Walesâ model because it mirrors some details originally commissioned by Prince Charles, estimated at up to $165,000. Both have secret agent style to spare, and we can all use some of thatâ¦. MI6 Note: Both cars are replicas and were not used in the filming of any EON Productions movie. Thanks to `Jared` for the alert.